NPO Kirikiri Revival Firewood:PROJECT 2 DONATE:WA WA PROJECT-Social Creative Platform for Opportunity-Know and support projects in eastern Japan ! In the town of Kirikiri, Otsuchicho, Iwate prefecture, two thirds of which has been transformed into rubble, the project Revival Firewood undertakes to collect and sell firewood from the debris. All income generated through sales is converted into tokens and returned to those who sweat and toil to collect the firewood. In this sea town where so many people have lost their jobs, this initiative aims to help by encouraging the circulation of currency. But surely eventually all the debris will be removed and there will be no resources left for firewood; The project founder has also considered its long term sustainability and intends to found a school to teach mountain forest thinning with a vision to develop the project 10 to 20 years from now. Kirikiri,in Ootsuchi Town,is located in the north of Kamaishi district,Iwate.On that fateful day,the town was also hit by a 20-meter- high tsunami,transforming two thirds of it into rubble.One of Kirikiri's residents,Masahiko Haga,sensed immediately after the ear thquake that a tsunami of immense size was on its way,and together with his family escaped to an evacuation centre located on higher ground. 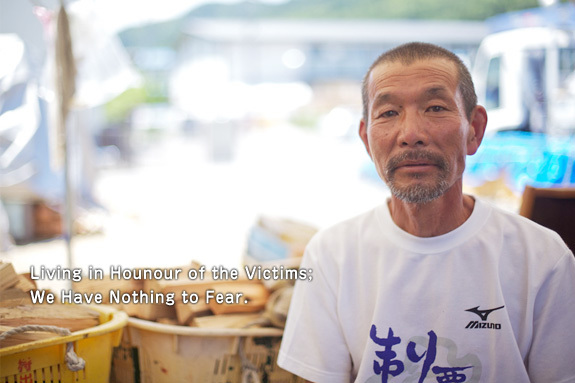 "After the tsunami,we weren't able to contact the municipal office at all.People who had gathered at the evacuation centre started to take action days after the tsunami.One group used heavy machinery that had survived intact to clear roads while looking for missing persons.Other groups cleared the wreckage from the school ground and made an emergency heliport,or pumped petroleum from petrol stations for use in oil lamps and vehicles.Everyone felt 'we have to take action ourselves,' so we were able to achieve big tasks.We did what was natural.I believe this is where the idea of 'community development' really comes from." Masahiko is currently initiating "Revival Firewood," a project where wood gathered from the debris is turned into firewood and sold.This 'Revival Firewood' is selected from salvaged Japanese cedar or red pine wood which had been used for many years in the residential buildings.All nails and clamps are removed by hand before it is split into firewood,and stored in rice sacks.The starting point of this project was the campfire of the evacuation shelter. 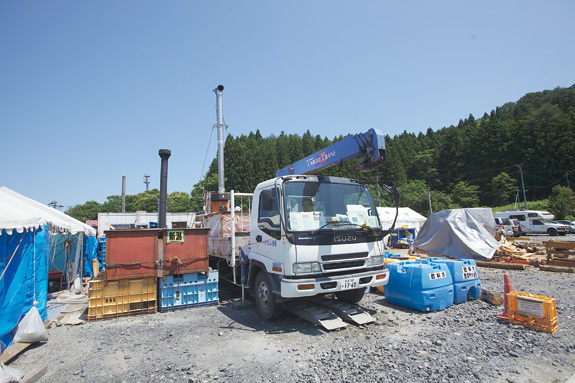 "At the evacuation shelter,we gathered firewood from the debris and used it for campfires.About one month after the disaster,a bath facility arrived at the shelter which used a boiler fuelled by firewood made from scrap wood.As we were making firewood out of the scrap wood found in the wreckage,one of the volunteers from Kansai area suggested,"why don't you try to sell it?" If the debris cannot be reused as firewood,it will only be thrown away.Even if it is covered in dirt,it can be returned to the state of untouched wood just by splitting it.That day,we decided that,in the same way that our campfire gave us cheer,we would try to kindle a warming fire in the hearts of others far away." The 15 or so members who join to make the firewood have all experienced living in an evacuation shelter.The sales made through "Revival Firewood" are returned to those who sweat and toil to collect wood,and also helps to stimulate the town. "The sales take the form of money coupons called 'Kirikiri Zenko'.In this town,only 3 or 4 shops have been able to reopen,but people who have received money coupons can use them to shop here.It might only a small amount,but it is better for Kirikiri to have some money circulating." 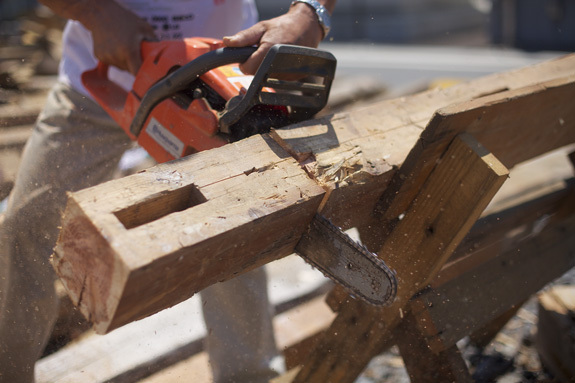 "Revival Firewood" is now inundated with orders from around the country,but the rate at which the debris is being cleared is making it more difficult to get hold of scrap wood.But from this,Masahiko has formed ideas for an even bigger project. "We have started to utilize,through forest thinning,the untouched planted forests which spread out around Kirikiri.Wood obtained from the thinning of these trees,which is suitable for use as timber in building construction,can be sold at the local Maruta marketplace,while the bent and leftover wood can be used for the second generation of "Revival Firewood," allowing us to continue ten,twenty,or thirty years from now.This is a sea town,but it is said that it will take at least three years for the fishing industry to recover.During those three years,the members of this industry will have no income.So we get the fishermen to take up chainsaws.Even though I have lost my house,and the town has been wrecked,I still want to live in Kirikiri.If I don't have a place to work,I'll create one." By selling wood through forest thinning,Masahiko says that an annual income of 500,000 yen can be made.Even after the fishing industry has fully recovered,when the sea becomes rough or in the winter season,a reasonable income can be made through this secondary business. "The heart and mind are important,but so is money.I am thinking about starting a training scheme in forest thinning for juniors over the next year under the name of 'Kirikiri Forest Industry School.' I want fishermen to join,too.In the sea they can maneuver a boat freely,and in the mountains they will be able to handle a chainsaw.I am also planning to run a computer class,so fishermen will be able to use computers,too.Not bad,huh? Everyone here in the 'Kirikiri Forest Industry School' is a teacher,school principal,and student so there is equality throughout." The sea,the mountains,and the people who work here form this town.Four months on after everything was lost in Kirikiri,a new 'town' is being born. "While encircling the campfire at the evacuation shelter,we all talked together.Some talked of lost family,relatives,and respected friends.Some saw the bodies of victims,some saw their faces.Everyone has decided in their hearts to live life in a way that honors the victims.The most important thing for we the people who have suffered in this disaster is to think 'what am I doing right now?What have I done up until now?What am I going to do from tomorrow?' so that we can become independent.In doing that,redevelopment will naturally follow.When you have experienced defeat,go into the mountains to thin forests,rest your mind,and stand once again on your own feet.While experiencing defeat time and time again,wouldn't it be better to shape people who can stand up to the world?That's what we're doing in Kirikiri." Scrap wood gathered from a mountain of debris. The wood used in bui lding cons t ruct ion dr ies out completely through many years of use, so even when soaked in seawater temporarily, the salt is naturally removed by exposure to rain. 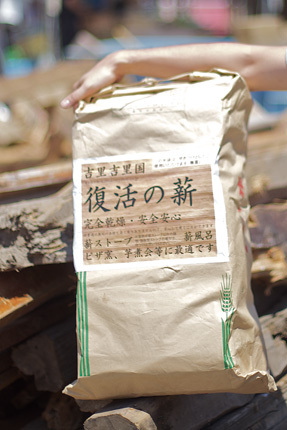 "Revival Firewood" sold for 500 yen per bag. Currently orders are flooding in from all over the country, with a two month waiting list. There is a bath heated by a firewood boiler at the workplace created for the "Revival Firewood" Project used by workers returning from the task of debris removal. Respose of souls and recovery - turning rubbles and debris to a form of firewood and sublimating by fire. I find it to be a very symbolic project where everyone shares the sense of "response of souls." Sound of cutting the debris into firewood marks the time of one’s life. This project was born because they understand what’s needed right now the true beauty and fear of nature. There is a hidden creativity and human power underneath the men-power to turn the debris to the firewood.